A herpes infection can be caused by both herpes simplex virus 1 (HSV-1) and herpes simplex virus 2 (HSV-2). Infection with the herpes simplex virus is categorized on the basis of the site of infection. 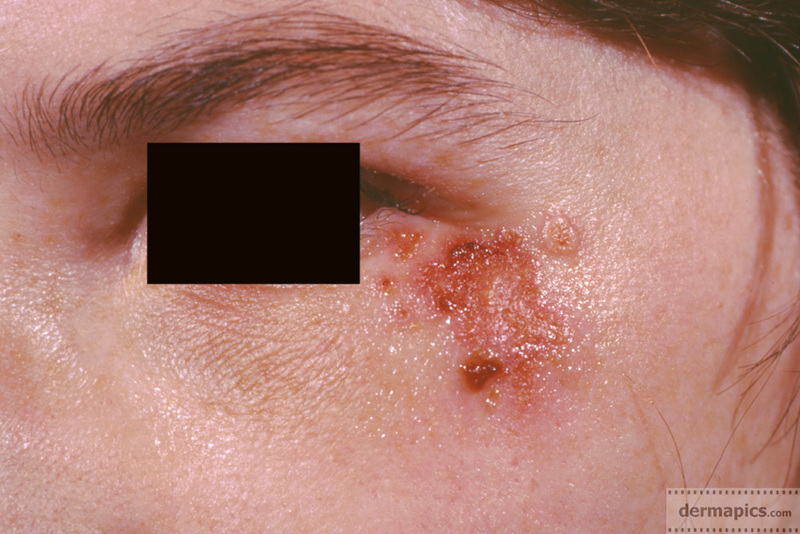 Herpes simplex is most easily transmitted by direct contact with a herpes lesion. Transmission may also occur through skin-to-skin contact during periods of asymptomatic shedding. picture: vesicles clustered in a characteristic group. Note the clear fluid in the vesicles. 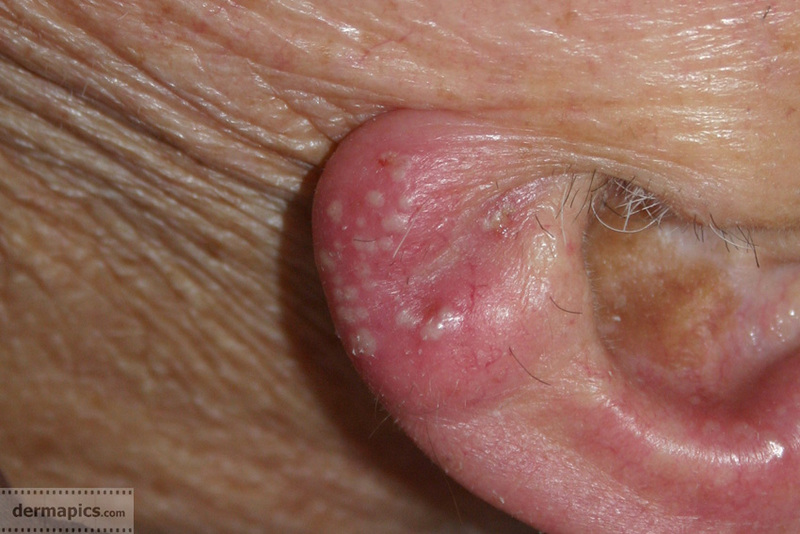 Herpes typically presents with small vesicles filled with clear or yellowish fluid based on an inflamed skin. Infection of the skin or mucosa may affect the face and mouth (orofacial herpes) although other skin locations may be affected. 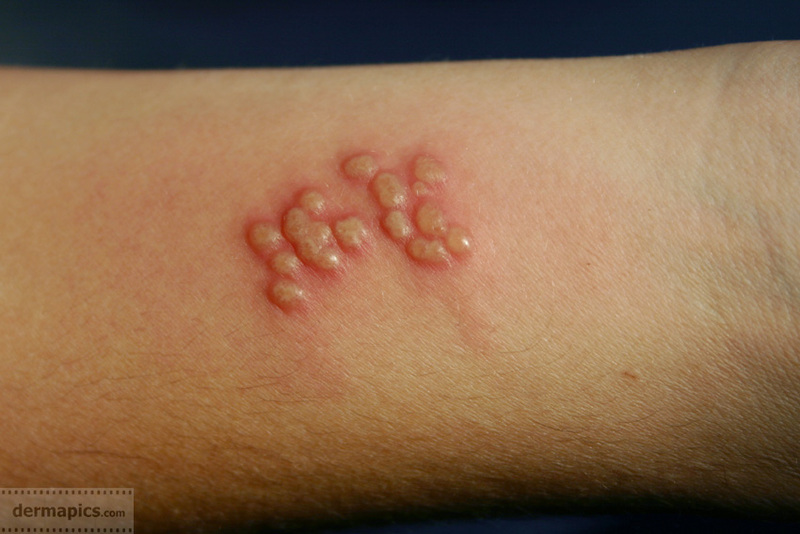 Examples are the genital area (genital herpes), or hands (herpes whitlow). More serious disorders occur when the virus infects and damages other organs such as the eye (herpes keratitis), or the central nervous system (herpes encephalitis). picture: an outbreak of herpes in the face. The first eruption is often the most most serious one. Subsequent outbreaks are usually less severe. 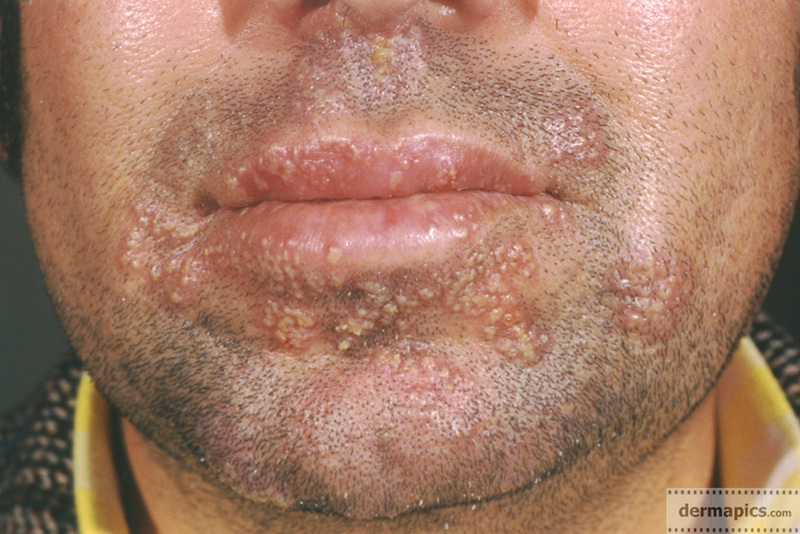 Primary (orofacial herpes) is mostly readily identified by phycisians. In case of doubt the virus can be isolated through laboratory test on swabs taken from the base of the vesicle. Picture: a herpes infection around the eye requires extra medical attention because the virus can affect the eye. In most cases the family doctor or dermatologist will recommend a visit to the ophthalmologist. Mild uncomplicated eruptions of herpes simplex require no treatment. There is currently no cure that can eradicate herpes virus from the body, but antiviral medications can reduce the frequency, duration, and severity of outbreaks. Straface G et al: Herpes simplex virus infection in pregnancy. Infect Dis Obstet Gynecol. 2012;2012:385697.